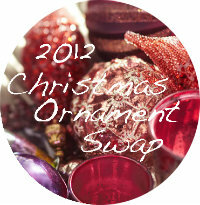 This year I participated in the 2012 Christmas Ornament Swap with Meg from Henning Love. It was great way to learn about new blogs and also a great way to celebrate the Christmas season. My swap partner was Katie from Dusty Window Panes. She is a new blogger with a great eye for detail. Her blog pictures are AH-MAZING. Here are the pictures of my ornaments. Aren't my ornaments FAB!! They are so me!! I love pink and I love bows. And of course, being from Massachusetts, I also love snow!!! Katie, Thank you so very much for the beautiful ornaments, I LOVE THEM!!! If you haven't already, check out Katie's Blog, Dusty Window Panes. It's now one of my daily reads!! Much thanks to Meg at Henning Love for having me!! What do you think of my ornaments? Love them! Everyone needs a little sparkle on their tree! FYI: I just launched a giveaway on the blog! oooh, that's a great idea! i need to participate next time!